NO Travel time charges (Metro), NO Fuel charges, NO Miles charges. ONLY PAY FROM THE TIME WE START TO THE TIME THAT WE ARE DONE. Full Door to Door Service with one of our ProMovers Teams. Free blanket wrap of your furniture. Disassembly & Reassembly (standard items) as needed. All Taxes, Mileage ,Labor, Tolls & Surcharges included. Valuation Liability Coverage of $0.60 per pound per item. This is NOT Full Value Replacement Insurance. If you desire additional insurance coverage, contact www.movinginsurance.com , at least 24 hours before your move. Number of movers team to be serving your move, include one truck. The hourly rate begins when the crew begins work at the point of origin and ends when all labor is completed at the destination. There is a minimum hourly charge 3 hours. (1St Class Moving charges by 15 min. so you do not have to pay full hour if movers work extra 15 min.) The total cost is based on an hourly rate. Should there be any other services requested or/and additional time , additional costs will be charged. Packing supplies are not included.If you have not provided us with an inventory of items this estimate will provide minimum charge information only. For a more accurate quote please feel free to contact 1St Class Moving Inc. and provide your relocation consultant with details regarding your move. What can effect my cost/time? : Size of the move, Stairs, Elevators, Long hallway, Weather condition, Distance & traffic condition between locations, Parking distance from the building. 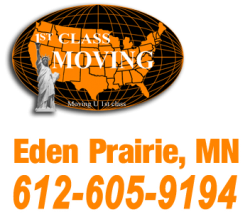 1St Class Moving offer professional packing and unpacking services at an hourly rate. The cost for packing materials will vary depending on services required at time of pick up. Materials may be required for items such as glass, marble, electronics, artwork, and large upholstered and fabric items. If additional packing materials are needed to safely transport your goods, it will be charged for accordingly. 1St Class Moving reserves the right to refuse loading any items if we determine that the aforementioned items have not been packed properly by the owner. Items up to 100lbs per mover, bulky, unusual size & weight items need to disclosed & required more than 2 men (Included but not limited to following, pianos, pool tables, Heavy appliances and similar), reasonable environment & reasonable access condition. service limitations can be applied to the full or portion of the service. Service may rescheduled or canceled During or expected severe/dangerous weather conditions. Deposit is required to reserve the day of the move. On the day of the move, payment can be in the form of Cash, Money Order or Cashier’s Check (No Personal Check). Paying with Credit Card: 1St Class accept only Visa & Master Card Only (No American Express). the card must be available for imprint/swipe & verification with matching ID (no transaction over the phone can be made when the card is not available). Security & delivery fee – The security & delivery fee is an amount charged by 1st class moving for processing your Card payment at the rate of 3%. The security & delivery is not a part of the payment you are making, but it is a separate charge on your card made by 1St Class Moving. Deposits are 100% refundable if given a minimum of 2 days notice of cancellation.